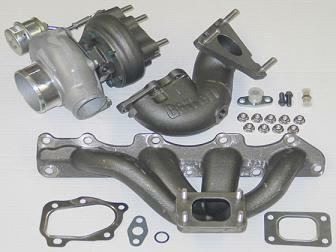 The Garrett® Chevrolet Cobalt Turbo Kit is for the 2.2L Ecotec engine for LS coupe and sedan model years 2005 and above. A GT2860RS "Disco Potato" ball-bearing turbocharger and all of the necessary components are included to complete the installation in your own garage! Garrett® Turbo Essentials Kit (P/N 772764-3) - AS PRICED AND AS PICTURED ! * Once the re-flash tool is used on a particular vehicle, the tune is non-transferable. The scan tool is VIN-specific and only works with the first VIN that is entered. The calibration of the tool is locked to ensure the integrity of the calibration. Use of a piggy-back system or changes to the calibration may result in engine damage.